The following is a content list of some of the main articles in the Western Pennsylvania History Magazine. 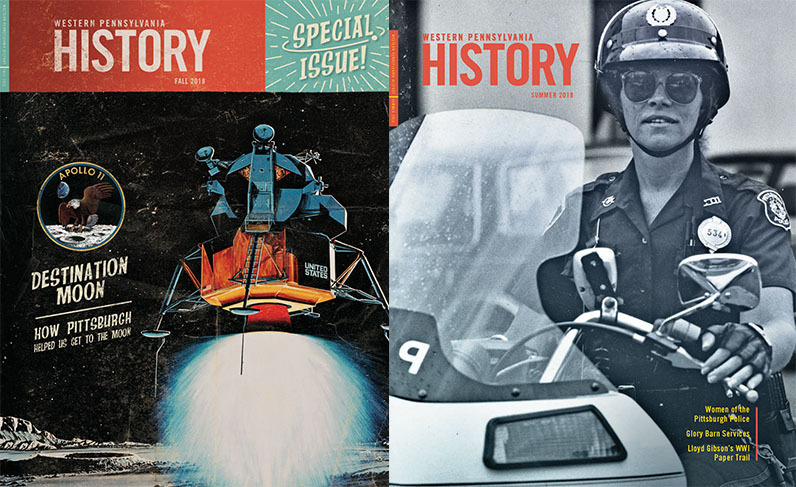 To purchase the magazines online, please visit the History Center’s online shop. You can also search and read PDFs of back issues of the magazine online. Pittsburgh Public Schools music teacher Paul Lawrence Peeler, Jr. The Winter 2016-17 Special Edition of Western Pennsylvania History includes a five-chapter feature on the History Center’s new exhibition, #Pixburgh: A Photographic Experience. With images featuring social gatherings and holiday traditions, family dinners and beloved pets, historic events and unforgettable milestones, the exhibit showcases the similarities between the subjects Pittsburghers photographed a century ago and what is captured by our social media-savvy society today. Highlighting an array photos from the exhibit, this issue allows readers explore the History Center’s vast photographic collections and the stories they tell. Mrs. Davis’ House in Sewickley – James Borchert, Ph.D.
Bring Your Family Tree to Life – Lisa A. Alzo, M.F.A. The Swan and The Ostrich (Oakland’s Fifth Avenue Villas) – James Borchert, Ph.D.
A Month of Surgery In Haiti – Edwin Bayley Buchanan, M.D.